First and foremost it is ok to say ‘no’, and not feel compelled to make a decision on the spot. Introducing a new family member is a long-term life-changing decision. You don’t want to make such a decision on a whim, do you? If this is your first Siberian Husky you might want to visit a few breeders to compare experiences and the range of puppies available. Good breeders know that different litters come from different parents and so have different temperaments, adherence to breed standards, etc. They will be more than happy to see you more than once and be patient answering all of your questions. If breeders are few and far between in your area you might even delay your decision for a couple of years and wait until a new litter is born. In general male Huskies are going to be more outgoing, more affectionate, but also more dominating and difficult to train. You are going to have to exert yourself as the alpha dog of the pack to maintain authority. 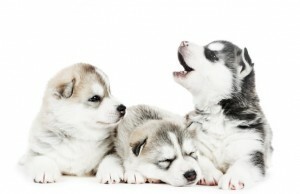 Female Huskies will bit more reserved, but tend to learn a little quicker and be more focused in training drills. If you have other dogs in the home you might want to avoid placing two males together because they could compete for authority over each other. However if you are a confident trainer and have some experience with Siberian Huskies you can probably overcome most of those issues. An energetic puppy that can’t wait to climb all over you might be cute, but is that the kind of dog you want long term? Can you match the energy levels? On the other hand, pups that slink away and show fear of strangers probably have not been socialized properly. For most people a “middle of the road” pup is the ideal choice. Look for a Husky puppy that engages with you, shows curiosity, and is not outright afraid of strangers. All of the puppies you are looking at should have been vet-checked with a report of good health. The pup should be vaccinated and wormed as well. Look for any discharge from eyes or ears which might indicate a health issue – the face should be clean. The puppy’s coat should be clean and and generally looking good. A sign of a good breeder is one that will offer a guarantee the health of the puppy for a period, say up to five years. Also check out our advice on general health issues that Siberian Huskies are prone to. Finally, but by no means least, you can simply ask the breeder for advice. A good breeder will ask you questions on what kind of lifestyle you live and should be able to help pair you up with a suitable pup from the litter. 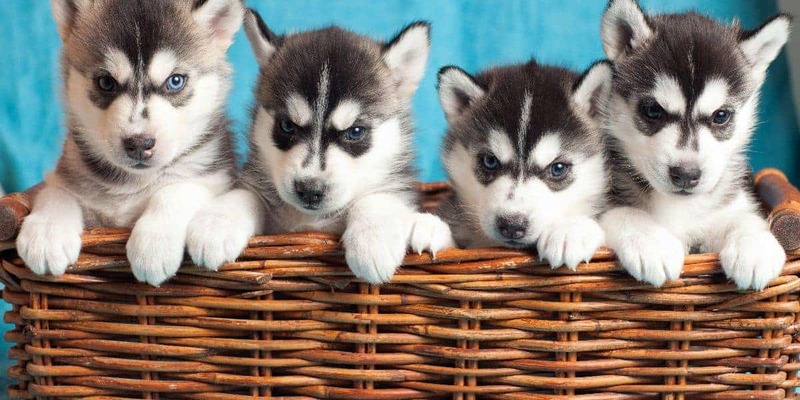 When you visit Siberian Husky breeders you should let the breeder help you in finding a pup suitable for you. Visiting a number of breeders might be required to aid in your selection. Unless you have experience in raising and training Siberian Huskies you are probably going to look for a puppy that is neither excessively shy, nor excessively energetic. Always look for a puppy that is in good health and likely to remain that way. Having difficulty finding a Siberian Husky breeder in your area? Check out our Breeders Directory for a breeder near you!